This has never happened in aquarium history, and perhaps (or maybe I should say hopefully) it will never happen again. A record stranding year has left us with numbers off our charts, and an incredible trio remaining at the Animal Care Center gave us a once in a lifetime photo opportunity. 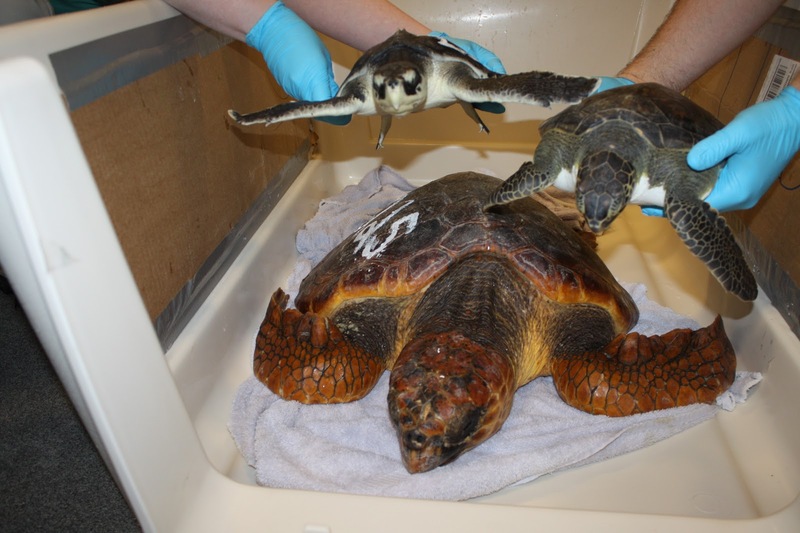 #25, a Kemp's ridley sea turtle, #125, a green sea turtle, and #225, a loggerhead sea turtle, provide a great visual of the high numbers of cold-stunned turtles this season, as well as 3 different species we see as a bonus! There are three common species that strand during cold stun season. Do you know the difference between them? Our powerful trio can show you! Kemp's ridley sea turtles ( such as #25 on the far left) are the smallest and most endangered sea turtles. We usually see the smaller juveniles around 2 to 5 years old. Their carapace, or shell, is round in shape and the smaller ones are usually a dark gray to almost black coloration. We have a tank just for our 4 green sea turtles (many other greens have been transported to finish rehabilitation at other facilities). These turtles are also juveniles when we see them at an average of 12 pounds, but they can grow to over 300 pounds when they reach adulthood! Their carapace is more of an oval shape with beautiful striations. Green turtles, such as #125, get their name because they eat vegetation in the wild. Their jaw has serrations to help tear the vegetation, while the ridley's and loggerhead have crushing jaws for crabs. They tend to have voracious appetites, and we usually have to limit their food intake and supplement their diet with lettuce. And then there is loggerland, what we have been calling our tank of loggerheads. Loggerhead sea turtles such as #225 are usually a bit larger that the other species when we see them in this area, but they are still juveniles. They are a beautiful mahogany color and they get their name from their large heads. You can read more about the remarkable number of loggerheads we've received this season here and here. 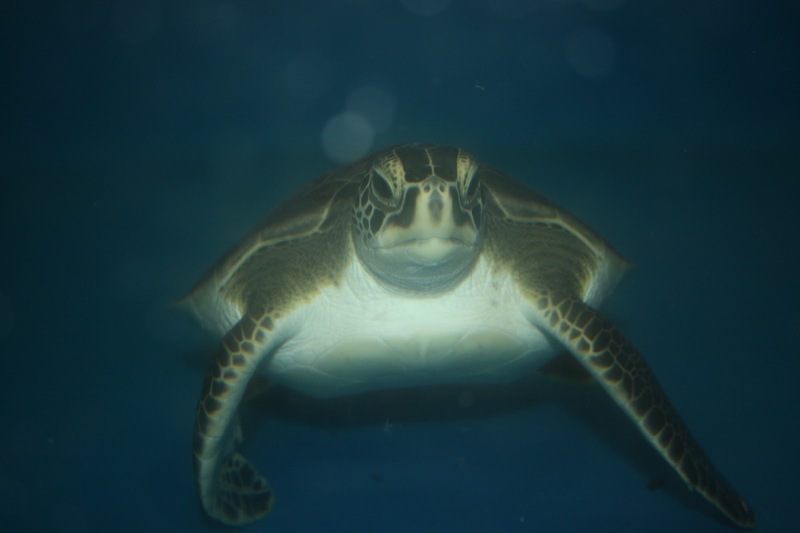 We may receive one to five loggerheads in an average year, but we have had 100 come through the doors this year alone! 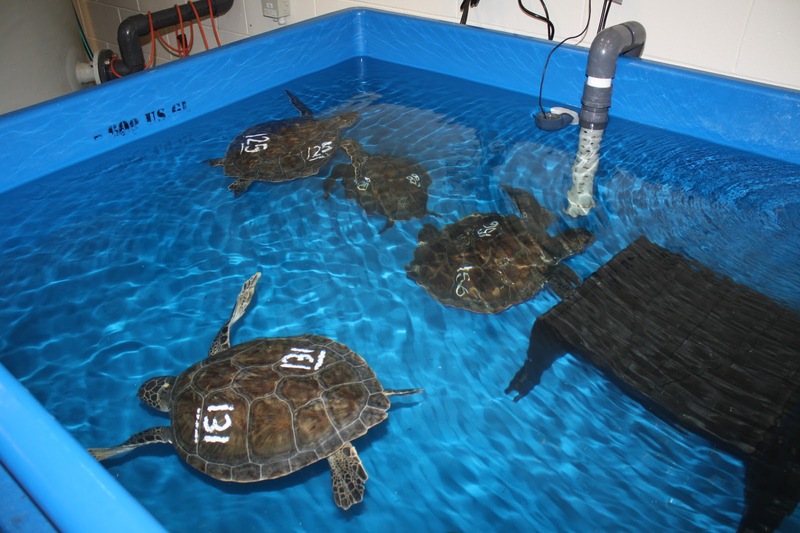 See video of all three turtle species in action here. 2012 was quite a year for sea turtle strandings and these three turtles sure know how to show it. We have never had a number over 200 before, so to have these three numbers still here after so many transports is a treat. The weather is much colder and the likelihood of more turtles coming in alive is slimmer now. 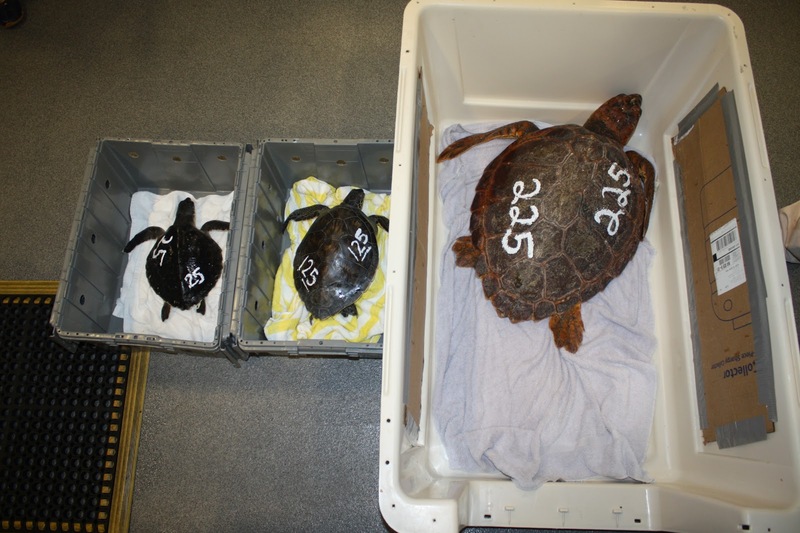 Could this be the end of our record setting sea turtle season? Or could we see a few more stragglers in 2013? We'll have to see what happens! 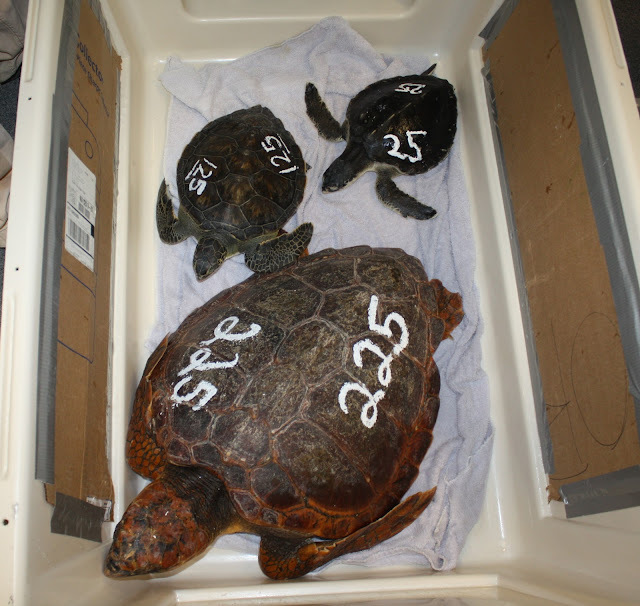 In the meantime, happy new year from the NEAQ Rescue team and turtles! Happy New Year to you as well and keep up the great work! 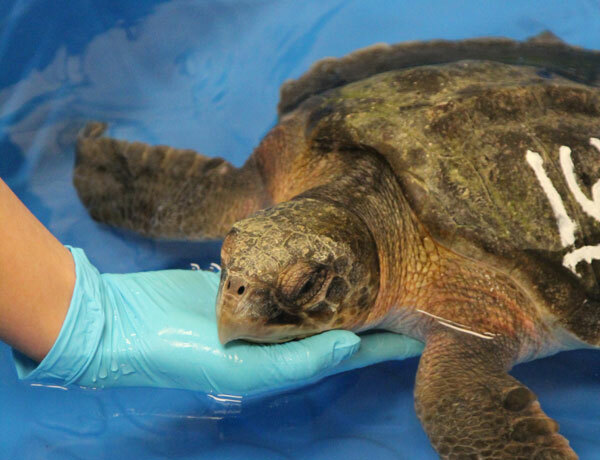 We visited a few of your cold stunned turtles at the Georgia Sea Turtle Center on Jekyll Island, where we spent Christmas. 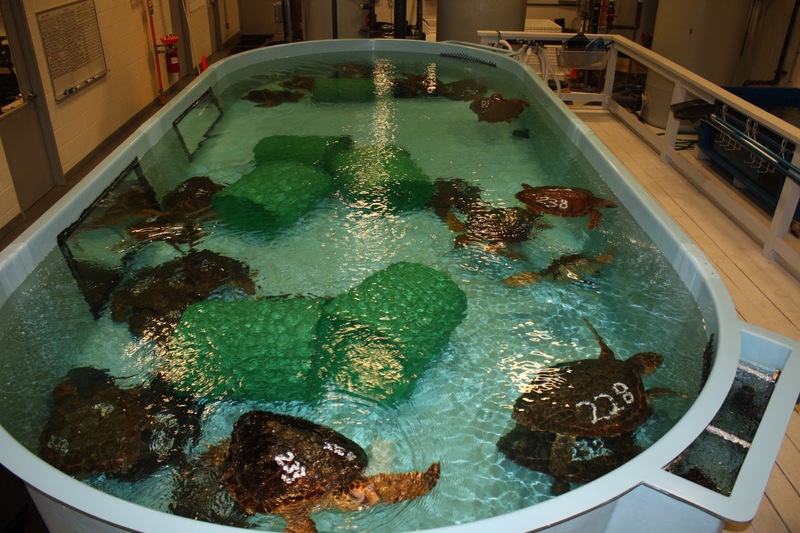 THe Center is fantastic, with excellent natural history information and a chance to visit the turtle hospital, which is where we saw turtles rescued on Cape Cod. Nice to see the collaboration in keeping these anials healthy - it takes a village. Keep up the good work! Do you need volunteers at your rehabilitation center?